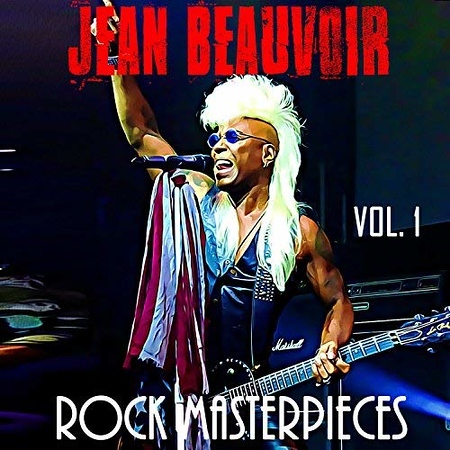 Jean Beauvoir has a long and distinguished career, releasing numerous albums and working on many more as a singer, bass-player, guitarist, song-writer or producer. The release of “Rock Masterpieces Vol 1” by AOR Heaven on 29th June captures some of the excellent tracks from his albums over the years; as a solo artist, with Crown of Thorns and with Voodoo X. I included the Crown of Thorns track “Rock Ready” on the Friday NI Rocks Show on 6th July. I remember Jean Beauvoir and his huge blonde mohawk from his early days with The Plasmatics but I wasn’t really a fan of the band and musically my first association would have been “Feel The Heat” from the ‘Cobra’ soundtrack. That track is included on this release – I actually had a promo VHS cassette for the single that had been sent to my uncle who was a DJ. The track actually comes from his first solo album “Drums Along The Mohawk” which was released in 1986 and it was chosen specifically by Sylvester Stallone for the movie. Another track from that first solo album, “Missing The Young Days”, is also included on “Rock Masterpieces Vol 1”. Ten of the fourteen tracks on this release are actually Crown of Thorns tracks. That band was formed initially in 1991 by Beauvoir and guitarist Micki Free, although the latter departed after the first album. They later teamed up for the Beauvoir-Free album “American Trash” in 2015 - http://www.rockradioni.co.uk/back-stage/music-reviews/2056-ni-rocks-recommends-qamerican-trashq-by-beauvoir-free.html . From the 1993 self-titled Crown of Thorns debut come the tracks “Crown of Thorns”, “Dying For Love”, “Hike It Up”, “Secret Jesus” and “Standing On The Corner For Ya”, although the latter is the 2017 version which was released as a single. The track “Heartbeat” comes from the 1996 album “Breakthrough” and “Lyin” is from the 1998 album “Lost Cathedral”. The other three Crown of Thorns tracks come from the album “Faith” which was released in 2008 – “Faith”, “Rock Ready” and “The One”. There are two tracks from the Voodoo X album “Vol 1 – The Awakening” which was released in 1989. These are “The Awakening”, which featured in the Wes Craven film ‘Shocker’ and “Voodoo Queen”.